Flo O’Riordan witnessed her two best friends being murdered by the British army. She narrowly escaped death herself but the painful memory of that day is still woven into the fabric of Flo’s life. Maura Meehan (31) and Dorothy Maguire (19) were sisters. Both were members of the female wing of the IRA, the Cumann na mBan. It’s only in recent years that Flo could publicly speak about those awful events. Flo and Maura had helped set up the Clonard Women’s Action Committee. One of the roles the group played was to alert the community if the British Army were raiding homes in the area. On the night Maura and Dorothy were murdered the sisters set out with Flo and a local man, Billy Davidson, after hearing the British army were raiding homes in the Lower Falls. With the introduction of internment in August of that year the women knew the army would be wrecking homes and arresting local men. The women had recently obtained foghorns. As they drove towards Cape Street they noticed a British army Land Rover across the middle of the street. There were 75 British army personnel in the area at the time, 32 of those were in Cape Street as part of the raiding party, a mix of Green Howards and Green Jackets. The car the group were travelling in turned left to gain access to Cape Street and at that point Flo clearly remembers seeing a soldier crouch down and take aim at the car. “I remember shouting ‘duck’ but it was too late - they had already started firing. “There was noise all around but inside the car I can only remember silence, complete horrible silence. “The girls didn’t stand a chance. The car swerved and hit the wall. I got out and looked into the back to try and open the door and get the girls out. “Maura was just bleeding from every part of her body, even her ankles were bleeding, one of the bullets had severed her spinal cord. 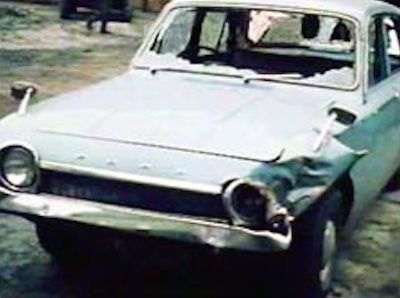 “The car (pictured) was like a pepper mill, completely riddled with bullets. They had wanted us all dead so no one would live to tell what really happened. “The shots had torn through Dorothy’s head and her whole face was disfigured. “People came from everywhere - it’s hard to put all the details into the proper sequence. Despite being badly injured herself Flo was only in the hospital for a few hours when the RUC came and arrested her. They took her to Castlereagh interrogation centre where she went through three days of hell before finally being charged with attempted murder of unnamed British soldiers. Billy Davidson attended a press conference the following day to dispute the British army’s version of events; the British said the women had opened fire on them from the car. “I was worried about my own six children and if they were okay but I knew the girls were dead and I knew that Maura’s four children would never see her again. “I got a hard time in Castlereagh. They threw pictures of Maura and Dorothy into the cell, pictures of their injuries, horrible pictures. Flo was finally given bail and allowed home to her children. She made it to her two friends’ funeral. At the inquest a succession of British soldiers testified. There was inconsistent forensic evidence. And after a trial that lasted five days, Flo and Billy were cleared of all charges, but found guilty only of dangerous driving, to stop any compensation claim for wrongful arrest. But if 1971 holds bad memories for Flo little did she know more was still to come. Less than six months later Flo’s son Sean was gunned down by the British army at the corner of Cupar Street and Cawnpore Street. He was just 13-years old, the second eldest of the O’Riordan children. The schoolboy was shot in the back of the head. “Even after all these years the pain still hasn’t gone away,” recalls Flo. “Altogether I spent five years of my life in and out of prison, but my children were the ones that suffered. “I lost my best friends, I lost my beautiful son, my children were left without a mother on many occasions. “There are times when I just fall to pieces. Sean’s birthday falls three days after the anniversary of Maura and Dorothy’s death. From there it is just a spiral of grief that lasts until the anniversary of his death on 23 March. “In many ways the actions of the women in those days was overlooked, it is always the men who get the medals. In republican circles it was acknowledged how important a role we were playing, but because it was all behind the scenes there was very little public recognition for the risks we took. “The difference with women who were involved is that they were also the home-makers, if they went to jail or died they were leaving their families to fend for themselves. “When you look at the political process and what we have been through... you have to ask yourself, all that suffering and for what? “My family have had their fair share of suffering, so have many others, but we believed that we were fighting for a 32 county Ireland. “I will never forget all those people who died, all those young lads who gave so much, and sacrificed their lives for that cause.